Please tell Macy's that promoting SeaWorld in the Macy's Thanksgiving Day Parade would offend many viewers. Other companies, such as Southwest Airlines, Virgin America, Taco Bell, and many others, have chosen to be on the right side of history by severing all ties with the cruel abusement park. Despite receiving information from PETA about SeaWorld's shameful history of denying animals everything that is natural and important to them, Macy's, Inc., is planning to include a SeaWorld float at the Macy's Thanksgiving Day Parade. SeaWorld's cruel treatment of animals and lack of concern for safety have been exposed internationally with the release of the documentary Blackfish. SeaWorld keeps intelligent, social ocean animals such as whales and dolphins in pitifully small tanks. In the wild, dolphins swim up to 100 miles a day in the open ocean, but captive dolphins are confined to small tanks in which the reverberations from their sonar bounce off the walls, driving them insane. Some of these animals were violently captured and torn away from their homes in the wild, and many are forced to learn and perform circus-style tricks. According to whistleblower tips from trainers, withholding food from animals who refuse to perform is a common training method, and because of the intense boredom and aggression caused by captivity, orcas gnaw on the metal gates and concrete corners of the tanks and damage their teeth and mouths. SeaWorld and other marine parks are not educational. Instead, they teach people that it is acceptable to imprison animals and deprive them of their freedom of movement, to deny them the chance to establish a natural territory and explore, to breed or separate them as we please, and even to watch them go insane from boredom and loneliness. 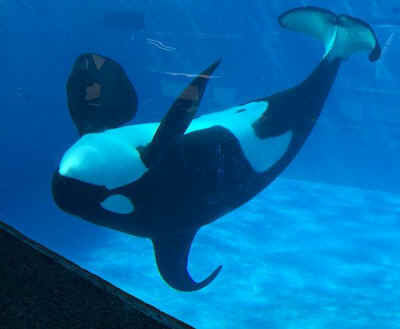 After the orca Tilikum violently killed trainer Dawn Brancheau at SeaWorld in 2010 (the third person he has killed), the Occupational Safety and Health Administration assessed the maximum fine against SeaWorld for willfully violating federal law. SeaWorld's own corporate incident log contains reports of more than 100 incidents of orca aggression at its parks, often resulting in injuries to humans.